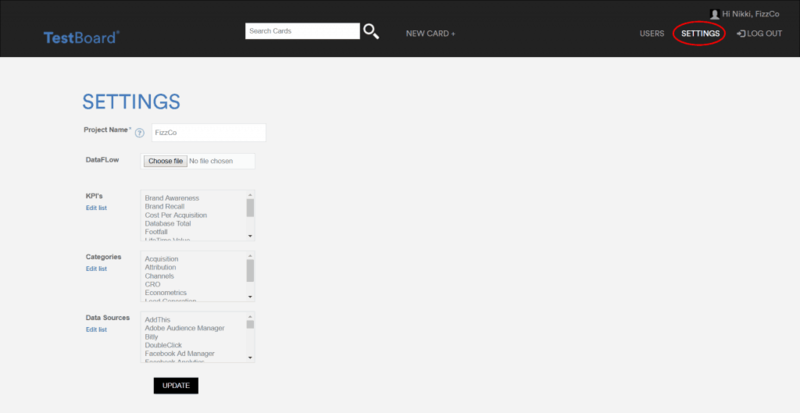 You can categorise your Cards for easy visualisation on your homepage dashboard. The category of each card is prominent in the table and in the charts. You can assign the category within the Card itself, on the first, Brief, page. Your account will be pre-filled with some sample categories, but these can be amended, updated or deleted in the Settings page. If you click on Settings in the main menu, you will see the current categories available in your account. Click on Edit List. You can add as many categories as you wish in the white box, clicking on Add for each one. They will appear in the editable list underneath, but won’t update in the list to the left until you refresh the page. You can also edit your categories list if anything is incorrect. Clicking on the TestBoard logo at the top of the page, will take you back to your homepage, where you can click back through to your Card. You will see that the category dropdown has updated with your new category. Once saved, your selection will display on your homepage.